Hello again everyone!! I hope you had a fabulous Holiday. I have spent a little time with my family over the past week and have finally got back to blogging. I sure have missed you all! I worked on a lot of things over the Holiday and came to the conclusion that I need a More Organized Home. With a full time job, a blogging career, and a family of four sometimes things get pushed aside and having a more organize home can be tough. I am feeling very focused and want to get a jump start to my spring cleaning and I am ready to do this!! I hope that you all will join me! Below I have compiled a list of fabulous challenges and free spring cleaning printables that will have you well on your way to a more organized home! 52 Challenges In The Organized Home Series is the altimate blog post for having an organized home. This post contains 52 links to articles that will have you working on kitchen organization, pantry, coupons and much much more. All over a 52 week period that will help you not feel so overwhelmed. Keeping it simple and organized is what this one is all about. Weekly and Monthly Cleaning Schedule Printable put together by The Frugal Navy Wife works great if you are a checklist sort of girl. This can also work well if you have older children in the household who are dong chores. They can also check them off as they are complete. The 30 Day Plan to Kick Clutter by Sparkspeople walks you through day by day tasks that will result in a less cluttered home in just 30 days! Apartment Therapy has put together a VERY important article together for you on What NOT to Do When Decluttering Your Home that you must check out! This article makes things simple and keeps you on track to a more organized home. Must Read! Take the Declutter 52 Things in 52 Weeks Challenge with the Organized Housewife and you will be well on your way to total organization. She walks you through steps and dates to organize your home one task at a time with categories like stuffed toys, broom cupboard and even kids coloring books! If you are really short on time, as we all are, you can check out the Redefied Moms 16 Ways to Declutter Your House in 5 Minutes or Less. This article walks you through all sorts of problem areas of you home. 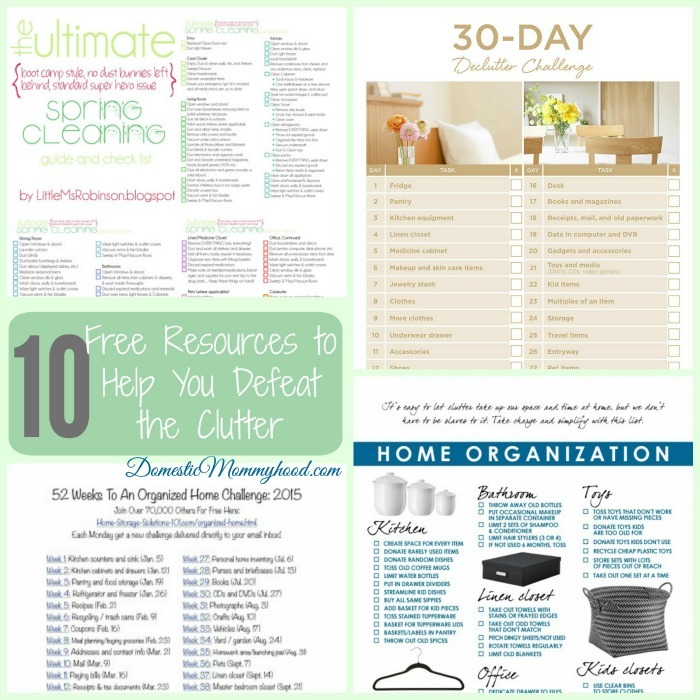 I hope you enjoy these 10 free resources to help you clear the clutter to a more organized home. I tried to take all the hard work of researching out of it for you and get you to your spring cleaning without all the headaches. Thanks for linking up wtih us at Sunday Features! Sharing on FB today! Thanks again. I definitely needed this!! Now I just need a clone or a few extra hours in the day! Thank you though…I think the best thing for me to do is break it off into chunks…it’ll never get done otherwise! Glad you shared this at #FoodieFriDIY…I’ll be sharing it on my Facebook page tomorrow! Have a great weekend!